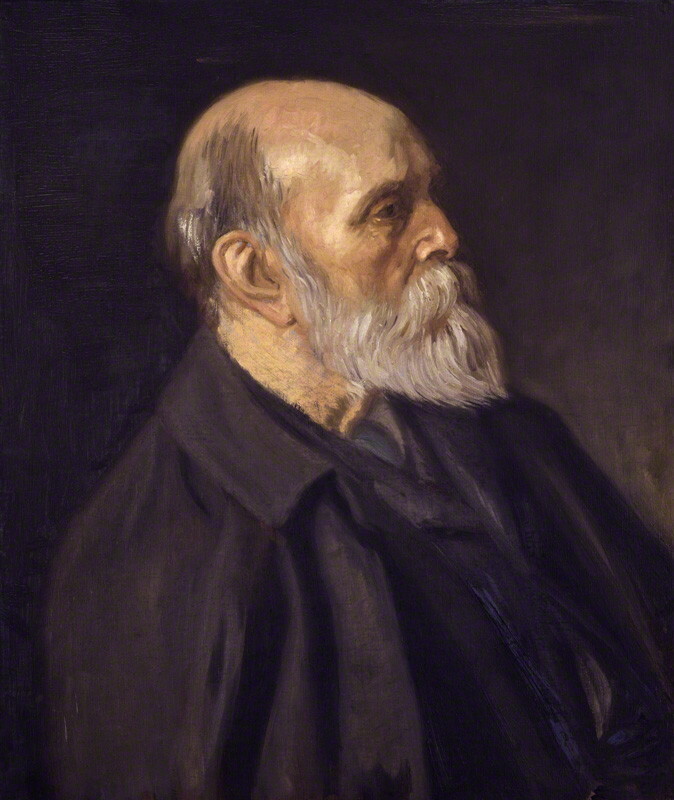 William Michael Rossetti is best known to posterity for his methodical cataloguing and publication of works related to his famous siblings, Christina Rossetti and Dante Gabriel Rossetti. However, Rossetti was a writer and critic in his own right: he produced over 372 pieces of art criticism between 1850 and 1878. Ruskin praised him as ‘one of the few who understand the real rank of a critic.’ Since the 1970s, Roger Peattie, Angela Thirlwell and Julie L’Enfant have reasserted Rossetti’s place in the Victorian art world as both a serious writer and an equally bohemian Pre-Raphaelite. Thirlwell compares what Rossetti did for the Pre-Raphaelite Brotherhood to Roger Fry’s work on the Bloomsbury Group. Interestingly, despite his large volume of criticism, Rossetti only published a single article with the Burlington. ‘Dante Rossetti And Elizabeth Siddal: With Facsimiles of Five Unpublished Drawings by Dante Rossetti in the Collection of Mr. Harold Hartley’ was published in the May 1903 issue. The article focuses on the life and work of Elizabeth Siddal, the artist and poet who married Dante Gabriel. Current art history focuses on Rossetti’s article for the Burlington as a lodestone for feminist discourse on Siddal’s artistic career whereas in L’Enfant’s survey of Rossetti’s critical writings the article for the Burlington was only mentioned as a footnote. For such a prolific writer, who in his diary praised it as a ‘new and very sumptuous’ art magazine, why was there nothing further published with the Burlington? Rossetti’s life from the late 1870s onward provides the background that leads up to the article. He acted as expert witness for the infamous Ruskin v. Whistler trial in 1878, judiciously contributing to the evolving definitions of art. He would never again be so active in the art world; 1878 also saw the end of Rossetti’s relationship with the Academy. He moved onto literary critique for the Athenaeum where Frederic George Stephens secured him intermittent work. In the 1890s, his diary records days filled with assorted tasks related to the family papers. He retired from his position as the Picture Inspector for Death Duties at the end of 1903. It was in this frame of mind that he was approached to write for the Burlington. Rossetti’s closest acquaintance out of the members of the Burlington’s original consultative committee was Charles Eliot Norton. It would be easy to assume that Norton was the inspiration for the topic, given that Norton was the first-ever purchaser of Siddal’s work, Clerk Saunders. However, Norton and Rossetti hadn’t been in regular contact since the 1897, likely due to executorial work on both sides. It was actually Robert Dell, the first editor of the Burlington who on 20th March 1903 called with facsimiles of Harold Thomas Hartley’s drawings and requested that he create an article around them. The exact direction of the article topic is not recorded. It is difficult to determine if Rossetti’s reasoning behind the tone of the article was, as Jan Marsh suggests, a way to protect the Rossetti family name from the scandalous associations of Siddal and Dante Gabriel’s unusual courtship and her untimely death. It is also possible that there was a genuine desire to memorialize Siddal. Rossetti had in common with his brother the tragedy of an artist wife who died too young; in the case of William Michael, the painter Lucy Madox Brown. Perhaps the anniversary of Lucy’s death, so near to the time of writing on the 12th of April, was also felt. By April 7th, Rossetti had finished the article and sent it off. There is no mention of the Burlington again in Rossetti’s diary until the 12th of July 1904. The entry is not positive as Rossetti was unluckily caught up in the October 1903 liquidation of the Burlington. Rossetti contacted Frederick Seymour Salaman, who was overseeing the liquidation, because he had not been paid the agreed £10. Rossetti then threatened to escalate the matter by bringing it to the attention of the Society of Authors. Non-payment would have been a major problem for the retired Rossetti, as he was supporting his three daughters alone. His diary for the following few years does not mention the Burlington again, so it is unclear if he was eventually paid or he was forced to write it off as a bad debt. The financial matter, however, is not the whole story as from the 1880s Rossetti’s written output in art criticism dropped off dramatically. Peattie, in fact, records only eleven published works by him between 1880 and 1910. Rossetti had reached his 75th birthday in 1904 and his health was in decline. The deaths of Stephens in 1907 and Norton in 1908 meant a shrinking network of friends and collaborators who provided support for his writing. This would have contributed to the lack of further articles for the Burlington. An additional factor to take into consideration is the declining critical and commercial interest in the Pre-Raphaelites and the more focused direction taken by the Burlington after Dell left the sole editorship of this magazine in December 1903. Under the new joint editorship by Dell and Holmes the magazine, in fact, concentrated (especially) on the art of the past and (less so) on contemporary British art, whereas Nineteenth century art, especially British, was hardly treated. Mentions of the Burlington were included in the manuscript of Rossetti’s memoir, Some Reminiscences. There Rossetti mentioned the Burlington and its committee members Charles J. Holmes, Claude Phillips and Charles Eliot Norton. But those mentions were removed in the 1906 published version, except for a small note about Norton under the heading ‘Other Acquaintances’. Their removal was probably part of a larger editing exercise as large portions that dealt with Rossetti’s acquaintances were omitted in the published version too. These types of edits may have been to reduce the size, as publishers had final say on the length of the work. Rossetti does not seem to have expressed any public resentment towards the Burlington or any of the committee members. Rossetti reputation for mildness wasn’t always deserved and he could be very critical of the contemporary art press. For instance, in later years Rossetti despaired of, ‘… the bad condition of British art-criticism at the present day. There is an immense amount of pretentious & fulsome verbiage, & very little solid meaning. In fact (but this may possibly be my own fault) I often don’t understand what the [intended writer’s] meaning is’. 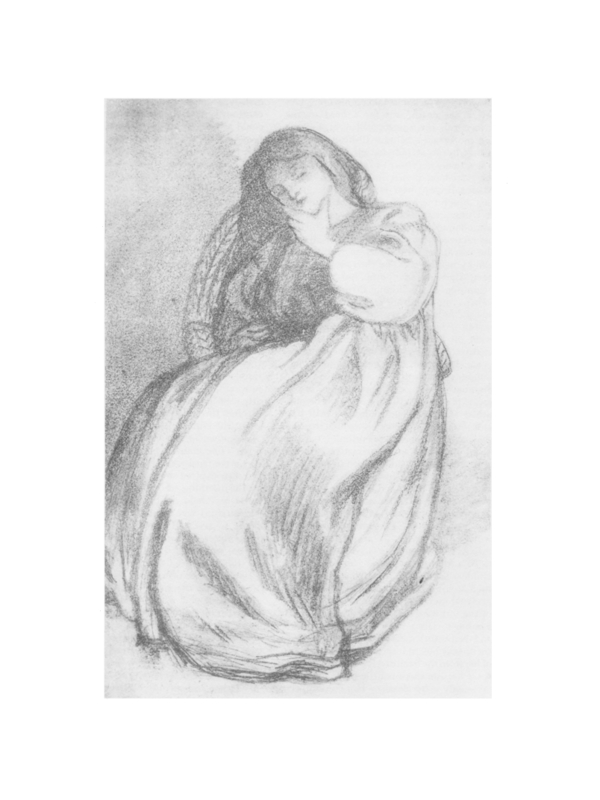 Dante Gabriel Rossetti, Elizabeth Siddal, graphite on paper, as published in The Burlington Magazine, May 1903, p. 289. The manuscript quotations are from: William Michael Rossetti, ‘William Michael Rossetti MS Diary, University of British Columbia Library, Rare Books and Special Collections, Angeli-Dennis Collection. Referenced on Microfilm Held at Bodleian Library, University of Oxford, Department of Western Manuscripts.’, 1676/1-3, Microfilm held at Bodleian Library, University of Oxford, Department of Western Manuscripts. R. W. Peattie, ‘William Michael Rossetti’s Art Notices: In the Periodicals, 1850-1878: An Annotated Checklist’, Victorian Periodicals Newsletter, 8 (1975), 79–92 (pp. 79–80). William Michael Rossetti, Ruskin: Rossetti: Preraphaelitism; Papers 1854 to 1862 (London, G. Allen, 1899), p. 53 <http://archive.org/details/ruskinrossettip03rossgoog; [accessed 2 May 2014]. Letter dated 13 February 1855. Angela Thirlwell, William and Lucy: The Other Rossettis (New Haven and London: Yale University Press, 2003) p. 2. Julie L’Enfant, William Rossetti’s Art Criticism: The Search for Truth in Victorian Art (Lanham: University Press of America, 1998). It is literally a footnote, p. 277. Rossetti MS Diary. 20 March 1903. Rossetti MS Diary. 29 December 1903. The Fitzwilliam Museum. ‘Clerk Saunders – Elizabeth Siddal’, 2007 <http://www.fitzmuseum.cam.ac.uk/opac/search/cataloguedetail.html?&priref=13598&_function_=xslt&_limit_=100; [accessed 2 May 2014]. William Michael Rossetti, Selected Letters of William Michael Rossetti. Ed. by Roger W. Peattie (University Park: Pennsylvania State University Press, 1990), pp. 602–603. Rossetti MS Diary. March 20 1903. Jan Marsh, The Legend of Elizabeth Siddal (London: Quartet, 1989) pp. 35–41. Rossetti MS Diary. 7 April 1903. Rossetti MS Diary. 12 July 1904. Rossetti MS Diary. March 19 1905. R. W. Peattie, p. 81. Rossetti MS Diary. 25 September 1904 and 30 June 1903. William Michael Rossetti, ‘Autobiographical Writings of Gabriele Rossetti and W.M. Rossetti’ Bodleian Library, University of Oxford, Department of Western Manuscripts. MSS. Eng. misc. d. 330-332; Ital. d. 18. Rossetti MSS, pp. 404-409 of MSS 332. William Michael Rossetti, Some Reminiscences of William Michael Rossetti, 2 vol (Brown, Langham & Co: London, 1906), p. 507. Rossetti MS Diary. 25 March 1903 and 1 January 1904. Thirlwell, p. 317. Library of Congress. Whistler-Pennell Papers 298 f 4042-3. Rossetti to Pennell, 13 December 1911.